Truly shocking revelations from royal biographer Andrew Morton allege that Meghan Markle, as a child, was obsessed with Princess Diana. Wow—just like fully two-thirds of women currently in their 30s. Next we’ll learn that she knew who Prince Harry was and joked about marrying him—again, like huge swaths of her generation. Morton is a royal character from way back, as the author of the 1992 shocker Diana: Her True Story, which was eventually revealed to be based on proxy interviews with the princess. (This caused an absolute uproar within the tight-lipped environs of the various Windsor palaces.) Since then he’s written several celebrity biographies but he continues to do a brisk business in royal gossip, including the recent Wallis in Love, about the other American divorcee who charmed a British prince. “She was her own woman now, earning a steady income, making new friends on set and off, no longer dependent on her husband’s connections. A £360 Vitamix blen­der symbolised the divide. One source told Morton that Markle mailed her engagement and wedding rings back to Engelson; “Another confirmed that the decision to end the marriage was made by Meghan and had come ‘totally out of the blue.’” Here it does seem important to note that it didn’t take long for Engelson to start working on a TV show inspired by Meghan Markle’s engagement to Prince Harry. After the discussion, Meghan and her friend Suzy Ardakani sat and watched old videos of the 1981 wedding of Prince Charles and Lady Diana Spencer. 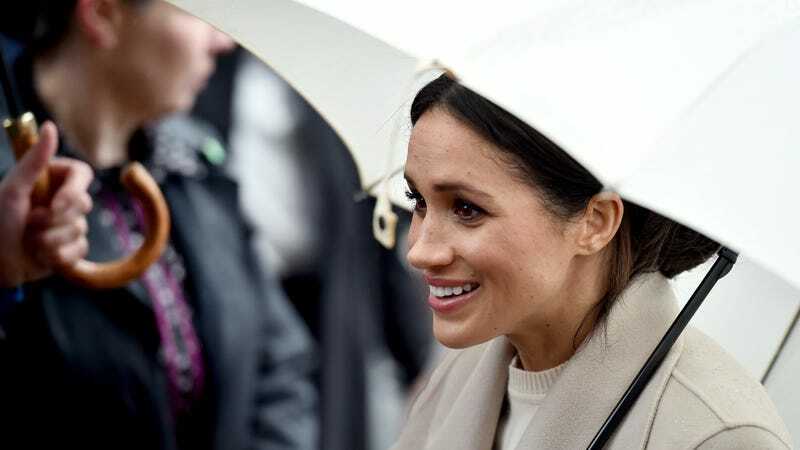 According to family friends, Meghan was intrigued by Diana not just for her style but also for her independent humanitarian mission. She saw her as a role model. Inspired by the princess, she and Suzy collected clothes and toys for less privileged children. In fact, such was Meghan’s interest that Suzy’s mother, Sonia, even gave her a copy of my biography, Diana: Her True Story, which remained on her bookshelves for the next few years. Maybe Meghan Markle does have a closet full of skeletons. Maybe she is ruthless. But if so, you’d think we’d be getting better dirt than this. Markle being obsessed with Princess Diana is simply a reflection of the fact that Di was literally the most famous woman in the world during the ’80s and ’90s. If anything, the notion that Markle has some Hollywood toughness and savvy under that fashionable exterior makes me feel comfortable enjoying this nuptial spectacle—like I’m not actually watching Bambi fed into a global media wood chipper.